A pin to make life easier! – This were the kids and I walking around Cerro San Cristóbal in Santiago de Chile! We got asked that a few times. Why didn’t we travel before the kids and let them have a “normal” life? Why take them? Isn’t it more stressful? It’s just too expensive! Well, we believe that travel isn’t only about leisure. It isn’t only having cocktails at the beach and partying until dawn. It’s about learning life, seeing other people, other cultures, trying different food, noticing how small we are. It’s about enjoying the ride, learning what we don’t know, seeing stuff, talking to the people. It’s about living life differently and noticing how connected things are. It’s about learning new languages, being comfortable being different, learning humility. Yes, it’s stressful at times, it’s a lot of work and it IS expensive, but it’s so much fun! I love seeing the kids looking at something for the first time, and all the stuff they learn just by being there is amazing. I just couldn’t take it away from them. And I wouldn’t, even if I could. 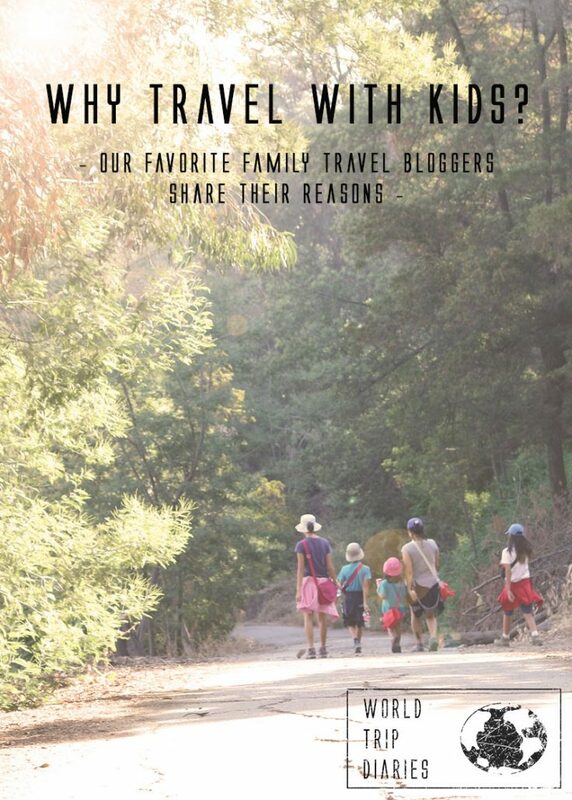 And I’ve asked a few of my favorite bloggers what their reasons on traveling with their kids is. Keep on reading! 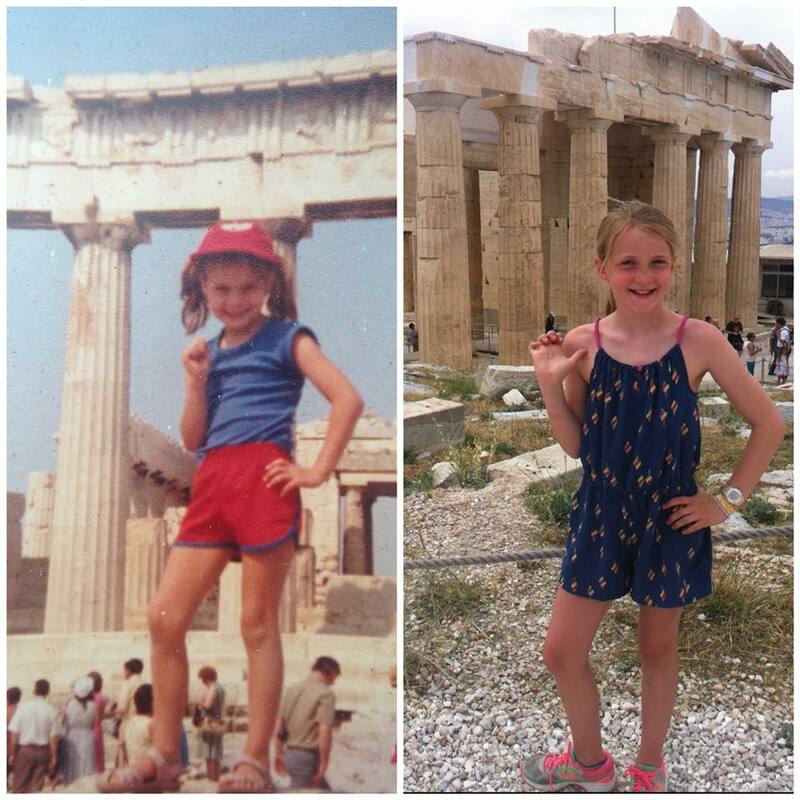 Gillian and her daughter in Acropolis – how cool is this? 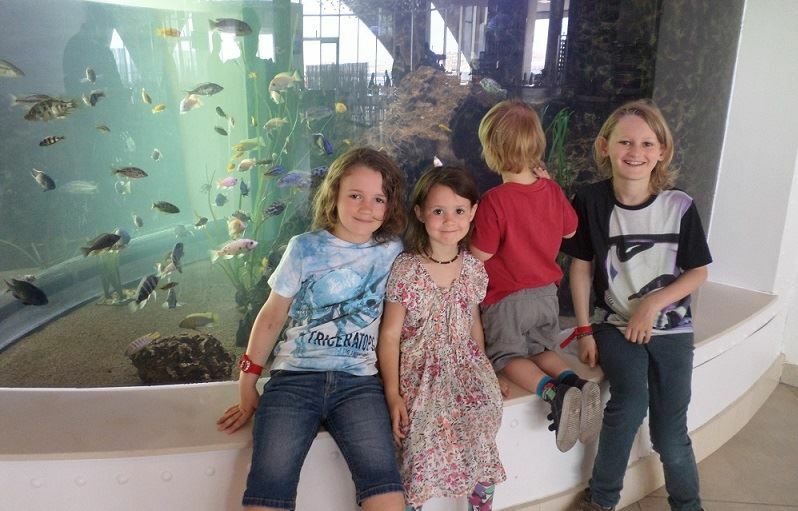 Why do you travel with your kids?” Was the question asked – Quite simply I think I have the gene. Recent studies are showing that there may, in fact, be a ‘Wanderlust Gene’ – some people are just born to travel! I can see it in my Mother also. She would pack us up in the car at a young age taking us here, there an everywhere at every opportunity. Growing up in the 70’s – 80’s having been to almost 20 countries by the time I was 12 did make me feel a little different from my peers. Things are different now, with the digital age here it is far more the norm for families to take multiple or extended worldwide trips. Families taking their kids out of school to travel or even homeschooling is a far more common occurrence. Using the world as your classroom has opened up a huge range of different learning opportunities. Kids all learn in a different way. My girls flourish learning hands-on in a more relaxed environment than sitting at a school desk. Whether it is History at the Acropolis, Marine Biology in the Gulf of Mexico or climbing a Glacier in New Zealand. Learning has more meaning when my girls get to do it for themselves rather than just reading from a book. The learning seems to creep in without even trying. In fact, it is just a bi-product of a great family adventure. 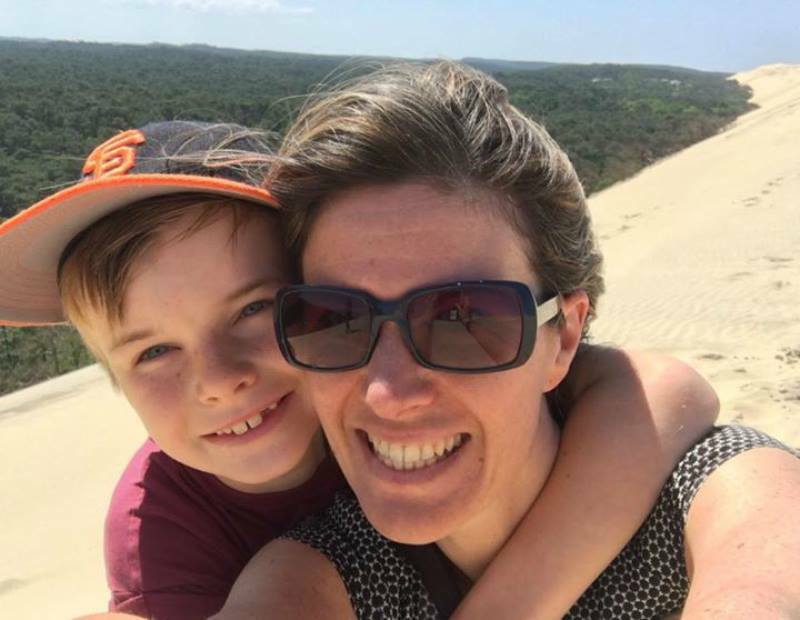 Now to make travelling easier and more affordable for all, I have built a website for travelling families to connect, rent and swap accommodation between each other. Find more details and join for free – World Schooler Exchange – A platform to rent or swap accommodation with other travelling families. I was bitten by the travel bug before having kids. My husband and I travelled around Thailand for a few weeks in 2008 and the experience changed my life. After a lengthy battle with infertility we welcomed our little boy, Ripley in 2012; and our little girl, Trillian in 2015. Before kids, my reasons for travel were just pure wanderlust. I never felt more alive than when I said goodbye to work for a few weeks and set out to explore a new landscape or discovered something new and interesting. Those feelings haven’t changed. I still have a healthy case of wanderlust. However, now I can see the wonderful impact travel has on my children’s wellbeing. Reason # 1 – I want to continue exploring the world and I can’t think of any reasons why I should stop and wait for the kids to grow up. Reason # 2 – I truly believe that travelling will open their minds to the world and teach them about tolerance and compassion; both qualities that I wish them to have. Reason # 3 – When we travel, I get to spend quality time with my family instead of juggling work and household duties. Reason # 4 – The kids force the holiday down to a slower pace which means more relaxing on the beach. Reason # 5 – Kids are actually really good icebreakers. This is awesome for someone like me who suffers from anxiety and finds it hard to strike up a conversation with strangers. We are not a couple that has ever felt the urge to settle down and stay in the same job or house until we retire! After University, a gap year travelling was not a viable financial option, but we did somehow manage a once in a lifetime trip to New Zealand. Whilst travelling around in our rickety old campervan (Internet bargain) we met a few travelling couples contemplating emigrating. Ultimately we jumped on this opportunity, being in the right age bracket and qualified in skill shortage areas. We left Manchester with working holiday visas and the promise of a teaching job interview in the south island. We did end up buying our first house and attempted to be ‘normal’, but ultimately ended up renting it out within a year and moving to Australia for 3 years instead. Eventually we got around to renovating that house and sold it along with 99% of our possessions in 2016. 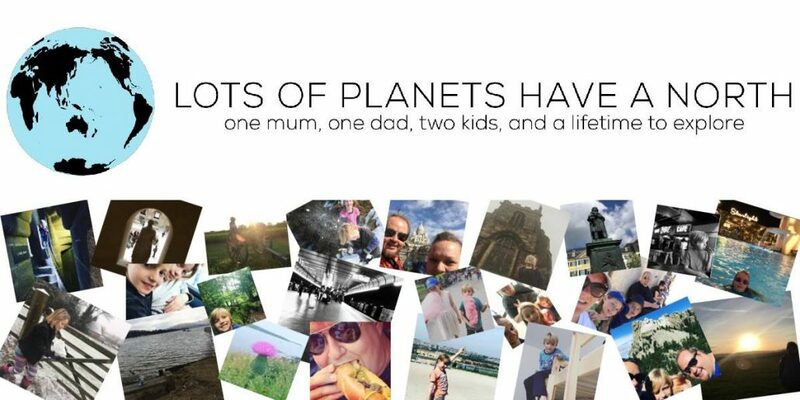 Buying tickets to Kuala Lumpur with no plans further than spending 3 months in Malta was the start of our family travel adventure. After spending nearly nine months in Gran Canaria we are now slowly exploring the United Kingdom. Will we settle down somewhere? Highly unlikely! Where next? Europe, Asia, South America, we’re not entirely sure but for the next 10 to 12 months we will be in the UK somewhere. Why do we travel? Tomorrow is not promised, we choose to live for today. We choose to spend quality time as a family and have amazing experiences together. Whilst we still have our health and the funds to do so we see no reason to stop exploring this big, wide world we all live in together! It’s all about FREEDOM for us! I caught the travel bug in the mid-nineties when I went interrailing with my best friend around Europe. I quickly became high on the buzz of discovering new places, foods, cultures and meeting new people. When I met my future husband, we travelled whenever the opportunity presented itself including two months round Spain and 6 weeks in New Zealand and Thailand. When our children came along, travelling took a back seat. This was in part financial and in part due to the fact that we were exhausted. We had two Duracell bunnies with no sense of danger and we simply felt that travelling with (our) young children wasn’t our idea of fun. However, as the years have passed and the children have grown older, we have now rediscovered travelling – as a family – and we absolutely love it. We get such a thrill at being in mainland Europe and being able to jump in the car, drive a few hours and experience a completely different language, gastronomy and culture. Sarah’s daughter’s been here on the blog before! I think we were just sick of life. That’s how we started travelling as a family. We loved our life, where we lived, our friends and family being close… but we were over the regularity, the stress of work (my husband worked in a high-stress sector), and keeping up with the clock and schedule of everyday life. I grew up in a family where going on vacation was a way of life. We were always tucked up in our caravan about to head out camping somewhere. As we got older our parents started to implement a yearly holiday, three weeks every July, we’d navigate our way around some part of Australia. Never to the same place. Always seeing new things. 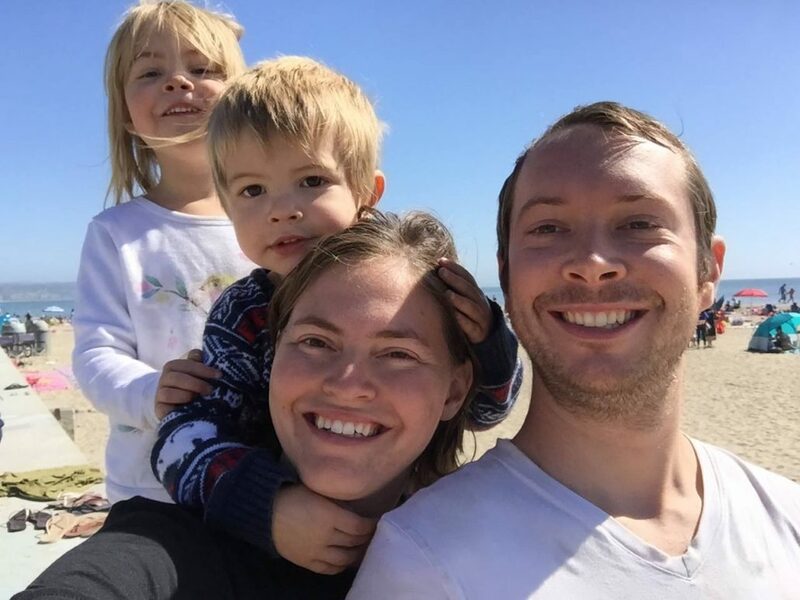 Now, I have kids of my own, and when we decided to pack up with the kids and travel, there was a huge part of me that was so eager to create for my kids those awesome memories that I had as a child. It is more than just seeing amazing things, it is about teaching the kids to be amazing citizens of an incredible world. It’s not all sunshine and roses. There are extraordinarily high highs, but there are also debilitating low lows. But we left to travel for twelve months, and it has been two years now… and we have another 18months planned… So, we must love this life! Will we ever stop? Who knows… There’s a lot to see in this beautiful world. Is it weird to say I have no idea why we started traveling? As a kid, I was privileged enough to travel quite a bit within the States but didn’t go international until I was a teenager. Through my teen years I was able to visit Canada, Belize, and the UK with my family. In college, I was able to go to France, Greece, and Mexico solo or with friends. During that time, I met a guy who had traveled way more than me. He had lived in Germany and been to many more European countries than I had but he weirdly wasn’t especially enthusiastic about it. I married him anyway and we found ourselves with two engineering incomes and started making our plans to travel the world. Correction: I was making plans and he was a willing but unenthusiastic participant! We managed fantastic trips to New Zealand and India before our first child made her appearance. Stopping traveling didn’t even come up in conversation and she took her first cross country flight when she was just 4 weeks old! That year we took her to Hawaii for our big trip and the next year we took both kids to Vancouver and Alaska. When the opportunity came for Chris to go to Bangkok for work, we refused to be left behind! The trip around the world wasn’t easy (at all) but it was so worth it. From that point, we knew that we could take them anywhere! Now that the kids are 2 and 4, each trip is getting easier and more fun, we just can’t stop! Going away together is a great way to bond as a family. When we are traveling we are more focused on each other and on creating wonderful memories! If you are a busy, modern family who wants to improve your relationships, I highly recommend scheduling a family adventure! Why travel with kids? Why travel at all, you might ask. My wife and I were frequent backpackers before kids, and we were travelling when we made the decision to try “settling down”. Apparently it didn’t stick. We’ve been asked a few times now, by other backpackers, “How is it travelling with young kids?”. They always ask with kind of a disbelieving look on their face. “It’s different, but still awesome.” is our answer. The focus changes for everyone. City parks become more important, historical ruins less so. The thing is, it’s easy to get so used to spectacular scenery that you don’t stop to appreciate it. Our kids yell “Wow!” EVERY time they see the ocean, mountains, big boats, even really tall trees. It’s easy to feel annoyed at the man in India yelling “Chai, coffee, chai, chai, chai!” at 6 AM on the overnight train. When the kids run around on the hill of the Acropolis yelling it, it transforms the memory to something else. It’s easy to have your day ruined by a crappy hotel room. 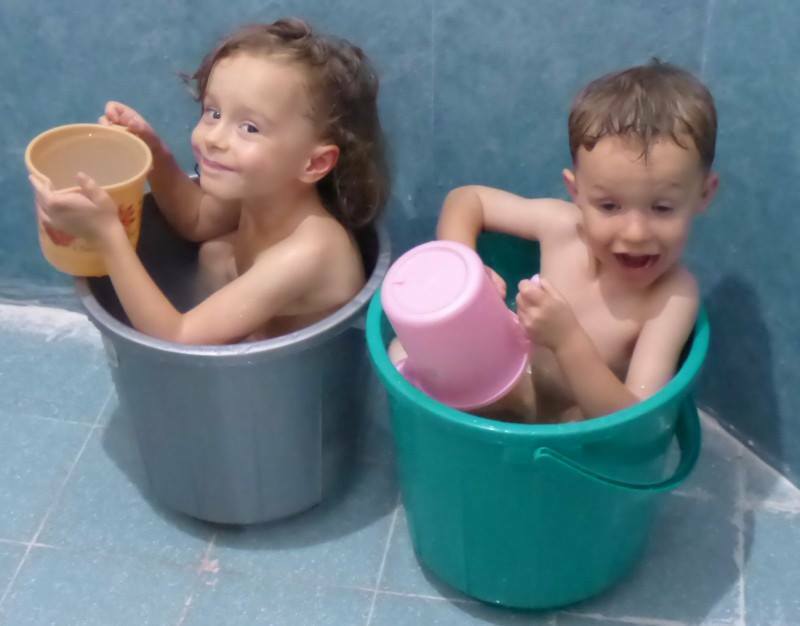 The kids are thrilled because there’s a bucket in the shower. It’s a whole new lens through which to see the world and the kids’ lens miraculously filters out the small annoyances of budget travel. Our kids are 4 and 5 years old, a boy and a girl. They spend every minute of the day together. They can kill 2 hours in a bus station with 2 toy cars and a tourism brochure, no problem. I doubt they’d be this close if they were in daycare, school, each with their own stories and friends. They’ve made friends along the way but every friend and every story belongs to both of them, together. No matter how much of the details they remember, they will always have this time of discovery, joy, and amazement they spent all together, as a family. That’s why we travel with our kids. Do you travel with your kids? Share your reason with us! I love how traveling is fulfilling such different needs for so many people! Thanks for including us! It’s a little bit of everything above that makes us want to travel and explore the world with our little one! I’d also believe the cost of traveling nowadays are significantly lower, especially airfares, and it’s reflected by our one and a half year old having already experienced Thailand, Indonesia and Japan! Enjoy while he pays only 20% hahaha. But yes, it’s a lot easier nowadays! 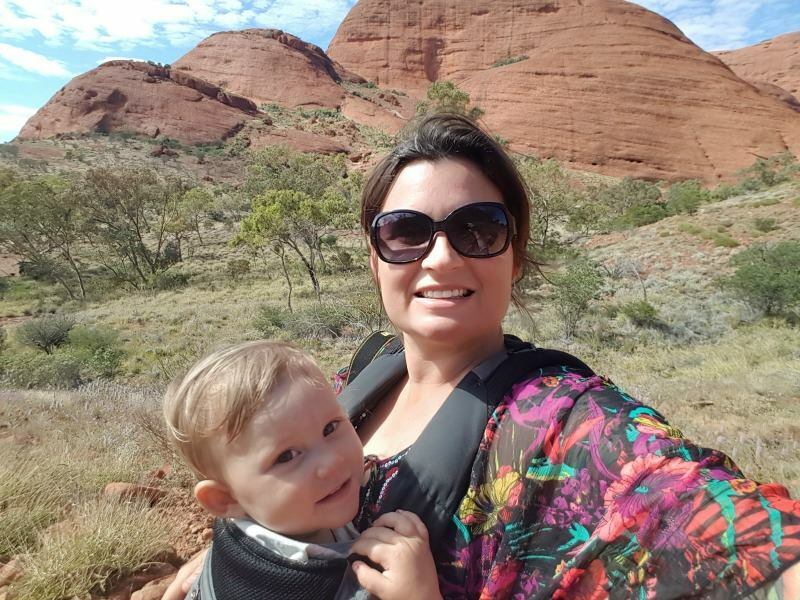 I believe it’s great for kids to grow up traveling and your baby is a very blessed one!